Pantomime  a practical guide is for the hundreds of people who find themselves involved in putting a pantomime on stage, and particularly for those working on limited budgets in smaller venues. 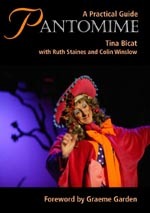 The information in this book comes from working practitioners with varied experience of pantomime. Making Stage Costumes is for anyone who finds that, despite a lack of experience and a meagre budget, they want and need to invent and create stage costumes. Topics include: understanding the structure and work of a theatre company; production meetings; budgets; de-coding costume clues in a script; altering modern clothes for period productions; set up and equip a workroom and understanding how to help an actor build character with costume. Written in a practical style that draws on the author's own enthusiasm and experience, Making Stage Costumes shows you how to make your ideas come to life on the stage. by Dan Diggles. This step-by-step guide offers actors, acting students, and acting teachers the definitive steps for using improvisation to build practical acting skills. An actor and improvisation teacher brings his tested methods to the page to help actors take risks and gain spontaneity in all genres of scripted theater. 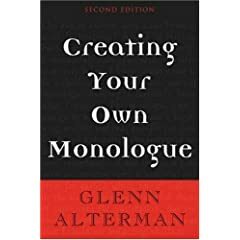 This book details how to create a safe, comfortable environment in which actors can experiment without feeling self-conscious and emphasizes improvisation as an act of cooperation, rather than competition. Through its 28 innovative lessonseach of which includes warm-up routines, points of concentration, and improvisation exercisesthis volume offers insights to thinking and reacting with fluidity, developing a greater awareness of fellow actors, becoming a good ensemble player, using the voice and body as effective tools of story-telling, exploring a characters social status, and much more. By using the clear, simple instructions in this book, actors will be able to take a fresh, original approach to classic characters, give funnier performances in farce and comedy, and make dramatic characters richer and more believable. This is a must-have for thespians of all backgrounds. 6 x 9, 224 pages, Paperback, ISBN 1-58115-325-2.
by Monona Rossol. Definitely a necessity for anyone involved in professional or amateur entertainment, this handbook is the only resource to offer all vital information about health and safety issues affecting the performing arts. Covered are topics relevant to every type of performance venue: stage, film, television, theme parks, circuses, parades, fireworks displays, and beyond. The author outlines safeguards against hazardous materials such a theatrical paints, certain makeup, pigments, and solvents, and recommends protective measures for woodworking, welding, using fog and other special effects. Safety checklists, agencies to contact for help, and other important tips are included. 6 x 9, 256 pages; Softcover, ISBN 1-58115-071-7.
by Lisa Mulcahy. Everything from finding a performance space, to creating a first season, to promoting your company and production, to designing a long-term plan is discussed in detail in this engaging guide--a sometimes irreverent, always relevant look behind and beyond the curtain of the modern stage troupe. Through personal experience and the "war stories" of esteemed stage veterans, the author reveals the pitfalls, passions, and practicalities of the theater industry. Chapters include developing business and budget plans, rehearsing, attracting attention with publicity and word-of-mouth, adapting to growth, and more. For everyone from the budding professional to the avid audience member wanting the ultimate back stage tour, no other book contains the unique insight and sound advice found in this indispensable reference. 6 x 9, 240 pages, Paperback, ISBN 1-58115-237-X. by Paul Harris. Author and successful producer Paul Harris blends his proven, hands-on experience with advice from industry veterans to show readers, step by step, how to become successful do-it-yourself off-off Broadway producers. This essential guide features hundreds of surefire techniques from selecting a cast to setting up rehearsals and putting on the performance. For anyone who wants to know what it takes to manage and produce a successful showcase production, chapters include: selecting the right play; creating a workable budget; finding a theater; raising money; attracting attention with publicity and advertising; rehearsing the play; putting on the performance; using the Internet; and more. This volume is filled with unique insights, tired-and-true advice, and sound guidance that can't be found anywhere. 6 x 9, 224 pages; Paperback, ISBN 1-58115-088-1.
by Drew Campbell. This innovative resource has been completely updated to reflect state-of-the-art standards in todays fast-changing theater technology. 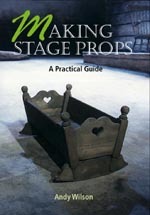 Designed exclusively for nontechnicians in the field, this pioneering book helps actors, dancers, playwrights, and directors to understand every aspect of a traditional and digitally supported backstage environment, from scenery, lighting, sound to props, and stage management to the use of integrated show control systems. The new edition covers new technology that has become mainstream, such as computer-controlled lightning instruments and audio (including various new formats), software to build audio cues, and PC-based audio play-back systems. A new chapter discusses show control systems that allow theater directors to make informed choices on which software to choose (the book covers DMX, MIDI, and SMPTI) and how to communicate their needs to a programmer. 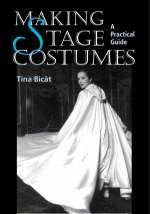 A chapter on costumes has been added to improve the communication between theaters and the costume department or rental company, including a check-list with helpful questions. All facets of production are clearly explained in jargon-free prose, and unfamiliar terms are highlighted and defined in an appended glossary. Besides theater newcomers and professionals, the book has targeted advice for event planners working and show producers working in the convention business, fashion, real estate, sports, and politics, including a special chapter on How to Do a Show in a Hotel. Written with clarity and humor, this is the definitive users guide to developing the vocabulary and technical skills crucial to working with technicians and technical equipment in a timely, efficient manner. 6 x 9, 272 pages; Paperback, 40 b&w illustrations, ISBN 1-58115-344-9. Through a series of inspiring, easy-to-follow exercises, an acclaimed director and drama coach shows both novice and experienced actors how to conquer the challenges of acting Shakespeare. Lessons cover all the skills needed for effective voice delivery: correct breathing, scansion, phrasing, and rhythm. For text analysis and character interpretation, both classical British training and American methods are explored. In addition to ongoing, long-term practice exercises, the book offers a one-day brush-up section to address immediate concerns of working actors cast to play Shakespearean roles. Beginning and experienced actors will learn how to use their acting skills to write successful monologues, performance art pieces, and one-person plays. The writing process is explained in easy-to-follow steps, from getting started, to expanding and tightening dialogue, developing character, editing and rewriting, rehearsing the final piece, and playing to audiences. Included are interviews with writers and directors, techniques for marketing and promoting solo shows, tips on brainstorming, and information about artists' communities, competitions, and grants. You may need to update your Mediaplayer, as this site uses *.asx streaming video and audio. Netscape users may require a plug-in to run the scripts on this site.